I’ve been reading the Moneyless Man‘s book recently. Author Mark Boyle was just a normal Irishman going to work in a suit until he realised that money is the root of all the world’s problems. So he did what any sane person would do: he gave it up. There’s more to the moneyless life than free books though. One of the big reasons Mr Boyle wanted to go without money was the massive waste, environmental degradation, human health problems and animal cruelty that are part and parcel of industrial food production. Yes, that. If you aren’t too keen on it either, all you have to do to relieve yourself of the guilt is stop buying food. BUT THEN HOW DO YOU EAT? It may come as a surprise to everyone, but food, unlike money, actually does grow on trees. It’s truly amazing. Some even comes in its own packaging, bananas, for example, and walnuts. So foraging is a great way to get free food, and once you start you can lose the gym membership too – all the walking and tree-climbing will do just fine. But I know you won’t do it. I might not do it either, although I wish I would. The reason I won’t do it (yet) is because I’m scared of eating death cap mushrooms, or similar death-inducing produce. In my view, that’s a reasonable fear. On advice from the Moneyless Man, I bought Richard Mabey’s classic guide to foraging, Food For Free. 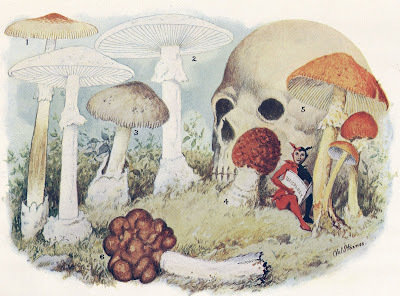 But the problem remains: what if I just mistakenly eat a death cap mushroom? The fact is that while I have no clue which wild fungi and herbs are which, there are people who do have this knowledge. What I suggest is that they programme their knowledge into an iPhone app. I don’t have an iPhone, but I promise to get one when this app comes to fruition. The Herbal Recognition app will be incredibly simple to use. When you come across a bit of plant that you’d like to eat, but you’re not sure if it’ll be the death of you, simply take a photo of it with your iPhone. The app will use state-of-the-art image recognition software, such as that found in Google Goggles to analyse the shape, colour and defining features of the suspect foliage. It may also use your location and the time of year in its calculation. Then it will give you a yay or nay on the question of whether to consume said flora, along with a percentage certainty that it is not going to kill you. Premium subscribers to the app can also opt for a video chat with a live expert, who’ll give the plant a thorough assessment, thus further reducing the chance of death. If you die, and you didn’t go premium, then it’s just your own fault. For me, the Herbal Recognition app presents a perfect synergy of ancient folkloric knowledge and splinter-edge technology. Who says the woods are no place for an iPhone? The Moneyless Man doesn’t just write books about his own harebrained schemes, he’s genuinely trying to promote more community-centred, sustainable living through the Freeconomy Community he created. Get involved and find some people to help you make the Herbal Recognition app! I recently posted on Amazing Stuff an exhibition of photographs depicting how places around the world have changed over time. To celebrate a quarter of a century’s worth of ideas (had I blogged at a rate of one idea a year (I’m trying)), here is an extra special idea – one I’m actually doing!